Planning a city break any time soon? 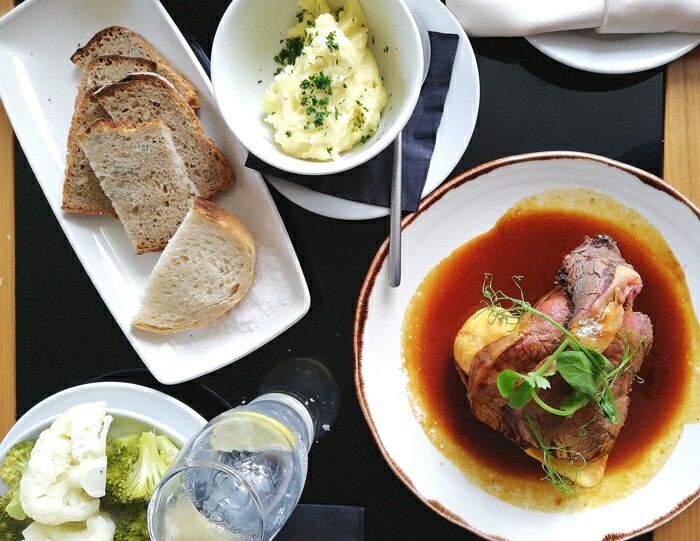 Quickly becoming one of the most popular foodie eco-conscious holiday destinations, here are 6 Excellent foodie reasons to visit the Isle of Man. Renowned for its outstanding combination of landscapes, nature, wildlife and heritage, Isle of Man is situated in the Irish Sea, between the United Kingdom and Ireland, and just an hour away by flight from central London. The Isle of Man is quickly becoming one of the most popular foodie eco-conscious holiday destinations, and for all the right reasons. Recently awarded by UNESCO as the first biosphere region in the world, Isle of Man is a happy place where nature and people co-exist harmoniously. This is incredibly well reflected in all the unique local delicacies you’ll taste around the island. With more than 70 award winning Manx products to sample, Isle of Man will surely conquer your foodie soul. If you’re looking for a relaxing holiday immersed in nature, heritage and local cuisine, look no further. Here are 6 excellent reasons to visit the Isle of Man, especially if you love superb local food! The Isle of Man is the first entire nation in the world to be awarded the prestigious status of World Biosphere Region from UNESCO. This means in simple words that the island is a special place for people and nature to co-exist, and local communities are encouraged to become actively involved in keeping it that way. Introducing energy-saving measures, supporting local produce and minimizing plastic waste are just a few ways adopted by the Isle of Man to bring people and nature together. So, next time you lay your hands on a Manx product, you can be reassured you’re getting something that has been made with care, in a eco-conscious way. The Isle of Man is a truly foodie paradise with over 73 local products (ranging from butter, cheese and ice cream to cider and spices) winning the prestigious Great Taste Award in 2018. 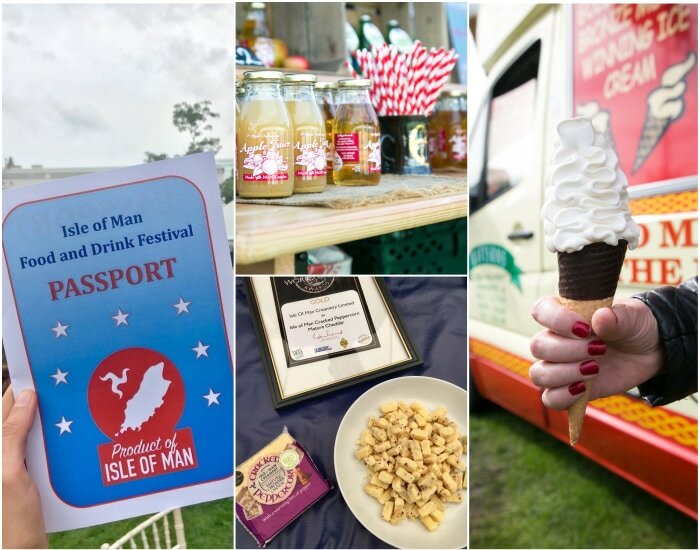 The Isle of Man Food & Drink festival, which takes place in Douglas every September, is the perfect opportunity to get a taste of all these amazing products. What’s best, you get to meet and chat with the people who actually make and produce all the local delicacies. Luxury Manx ice cream: handmade, with the freshest Manx milk and cream – Need to say more? Award-winning Cheese: The Isle of Man Creamery, a small co-operative of family owned farms, produces award-winning cheeses including the Vintage Cheddar and Black Peppered Mature Cheddar. Manx Apple Juice & Cider: The Apple Orphanage produces handcrafted apple juice and cider using only fruit grown in the Isle of Man. They make the most of all the exceeding apples around the island using a simple Fruit Exchange program, which allows local families to swap unwanted apples (and other fruits) with freshly handcrafted juice. 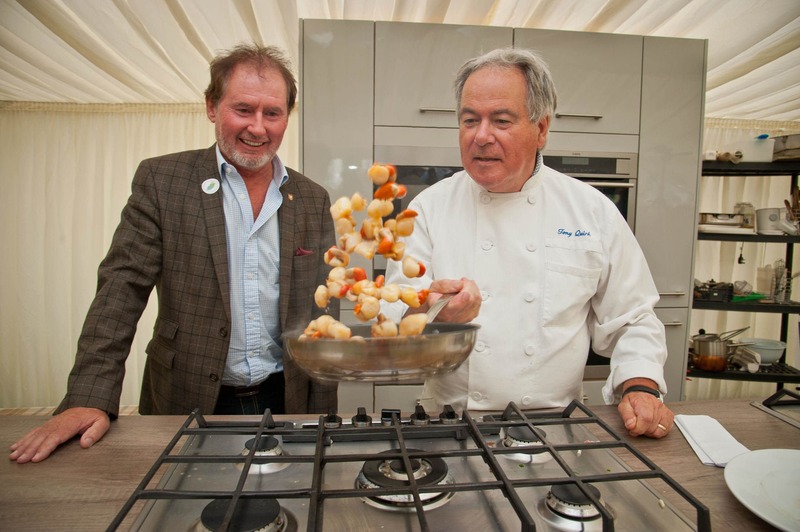 Chef Tony Quirk cooking queenies, the new Manx national dish, next to Hon Geoffrey Boot, Minister for Environment, Food and Agriculture. World-renowned for their quality and superb taste, Manx queenies have been crowned as the Isle of Man’s new national dish just a couple of weeks ago, and for all the good reasons. Known in most places as Queen scallops, this Manx delicacy is similar to the King scallop, but smaller, sweeter and juicier. Queenies are sustainably sourced straight from the Manx waters, and served all over the local seafood restaurants and cafes. 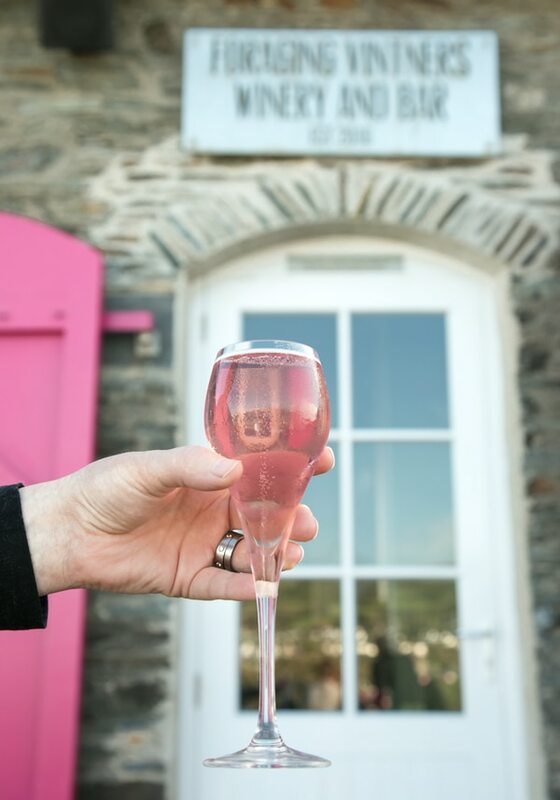 Located in the beautiful Port Erin bay, Foraging Vintners winery opened its doors in 2016 in a renovated coal shed. Over the years, Ian and Mary Beth have mastered the art of making sparkling non-grape based wines, using eco-friendly methods and locally produced ingredients. You can book a wine tour and learn all about the winery’s unique rhubarb and elderflower sparkling wines process following the méthode traditionnelle. Some things you should definitely try in Douglas are the horse drawn trams that run along the promenade, the steam train to Port Erin, and obviously the local cuisine. Douglas city centre is packed with cozy, vibrant restaurants and cafes showcasing the local cuisine. Get a taste of the popular queenies and other super fresh fish and seafood (including 1.5 pound lobsters!) at Tanroagan restaurant. Beautiful décor, attentive staff and superb food, make it one of the best restaurants in town. For a lovely breakfast/brunch/lunch in the heart of Douglas, head over to the cool Little Fish Cafe, or get coffee and delicious vegan & gluten-free cakes ad treats at the pretty & cozy Noa Bakehouse. Traditional smoked kippers is a must-try Manx delicacy exported all over the world. If you want to get a real taste of the best kippers around, visit Moore’s Kipper Factory. 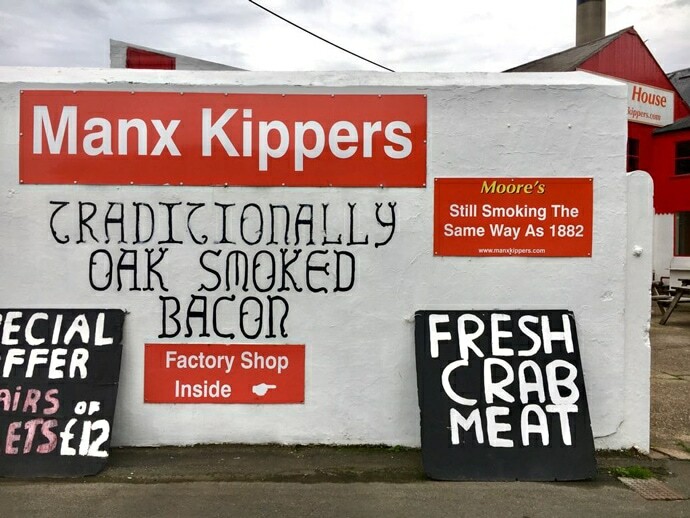 Situated in the historic fishing port of Peel, family-run Moore’s Kipper factory has been in the business for over 120 years, and they’re the only ones to still produce traditional, oak fired, chimney smoked Manx kippers. The fish is first cleaned and soaked in brine, then hanged over long wood sticks, and oak smoked above fires for 6-12 hours. This slow century-old method allows the herrings to reach their distinctive, hard-to-beat smoked flavour. You can even book a tour of the factory, watch the whole kipper making process and learn more about its fascinating history. 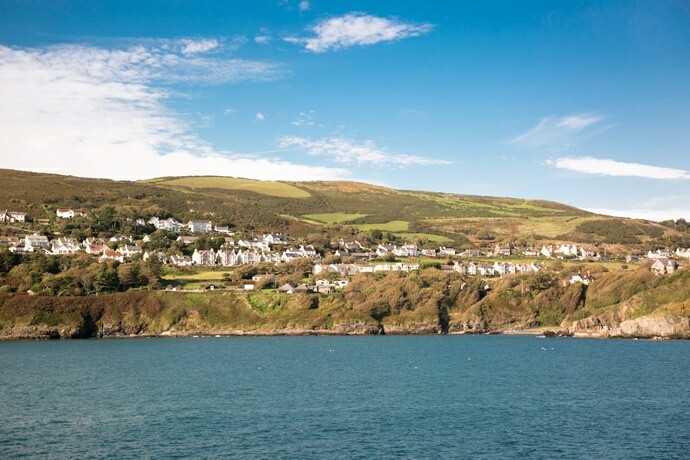 To make the most of a short-stay in the Isle of Man, I recommend staying in Douglas city centre, so you can explore the city by feet, and have easy access to transports and taxis to explore the rest of the island. There are plenty of pretty hotels along Douglas Promenade. We stayed at the Claremont, a modern luxurious 4 stars hotel located right in the heart of Douglas. Our room was spacious, modern and fully equipped with all necessary comforts for a relaxing stay. The hotel bar & restaurant is also lovely, with carefully selected food & drink options and a welcoming super attentive staff. Plus, they offer a delicious traditional Sunday roast. Late spring and summer months are obviously the best time to visit, especially if you want to make the most of the beautiful beaches Isle of Man has to offer, or witness the TT Races – the most famous motorcycling road race event in the world. 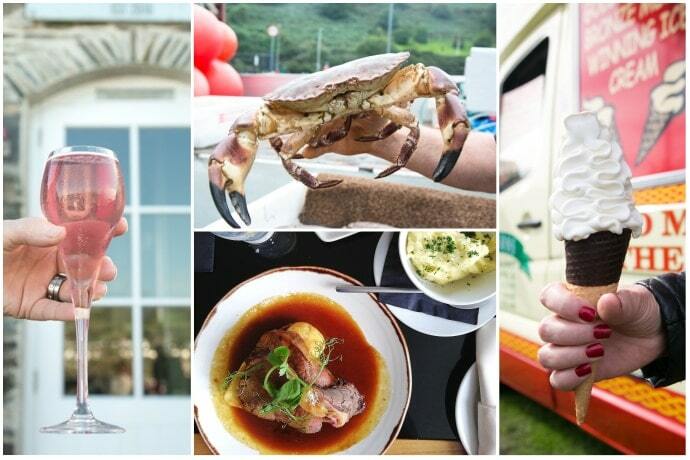 However, I loved visiting during the Isle of Man Food & Drink festival in September. The weather was still delightfully warm and mostly sunny, and the festival alone is one of the best reasons to visit the Isle of Man during this period! Looking for more inspiration? Check out more foodie adventures on TPC. What a beautiful vacation destination! Hopefully some day we will be able to go there! This looks great! Such a great place to travel! I’d love to visit with my family!